On behalf the Atlantic Chapter of the Canadian land Reclamation Association, we would like to thank the delegates, sponsors and presenters for their contributions and participation at the 7th Atlantic Reclamation Conference in Wolfville, Nova Scotia. 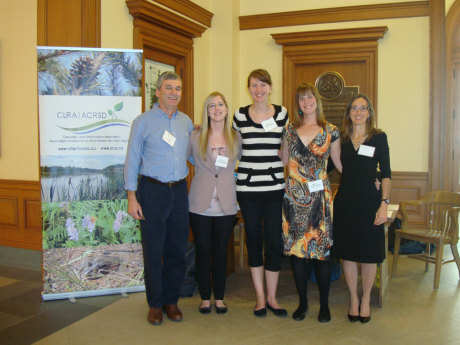 Acadia University’s KC Irving Center was the host location for 26 presentations in seven areas of reclamation. More than 60 registrants were present for technical presentations in R3 Innovations (Reclamation, Remediation, Restoration), Celebrating the Sydney Tar pond Accomplishments, Mine Site and other Brownfield Reclamation, Long-Term Monitoring, Freshwater Habitat Creation and Restoration, Freshwater Wetlands, and Salt Marshes and Dykelands on October 29-30, 2014. These presentations will be posted on the conference website in early December (www.atlanticclra.ca). More than 40 registrants participated in the Pyritic Shale Workshop co-organized with ESANS on October 31. We would also like to congratulate the conference organizers for a successful conference and thank the co-chairs for all of their time and emotional commitment to this event. Sandra Lynch and her networking pulled in four young volunteers to handle the event day registrations. 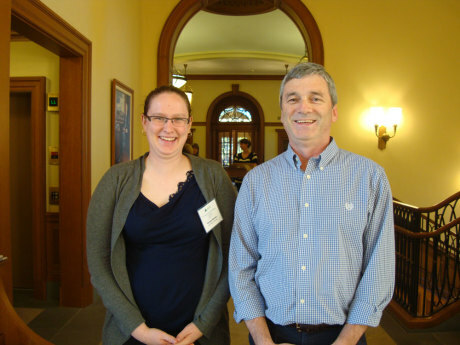 Christa Skinner from St. Mary’s University was the CLRA Atlantic Chapter scholarship award recipient for her presentation “Temporal and spatial patterns of soil chemistry and primary productivity in a restored salt marsh”. Once again, Ducks Unlimited contributed locally grown wild rice as speaker’s gifts. The surrounding photos are of Christa Skinner with Frank Potter, refreshment break in the Garden Room, student volunteers Shauna Pettipas, Kathryn Turner and Baillie Holmes along with conference co-chair Frank Potter and 2014 Atlantic Chapter President Michele Coleman, speaker Fred Baechler presentation and the beautifully crafted KC Irving Enironmental Center wooden podium (http://kcirvingcentre.acadiau.ca/). As part of registration, all participants have been registered as members of CLRA for 2015 and can look forward to receiving the 2015 publications of Canadian Reclamation and all of the other member benefits. 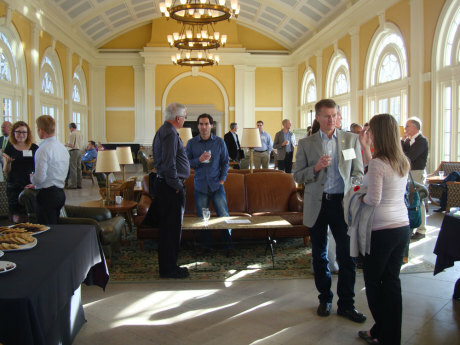 We hope that all participants enjoyed and benefited from the presentations, the networking, the discussions, the well attended CLRA discussion meeting and even the after hour social gatherings. We would appreciate any comments or input you may have that would increase the success of future conferences. The next events include a technical talk by CarbonCure in the winter, a tour of a wetland compensation project by Mike Parker of EastCoast Aquatics in the late Spring, and preparations for ARC 2015 in the late fall in Fredericton, New Brunswick. Congratulations to Andy and Frank on the success of the conference and to Christa for the scholarship award.